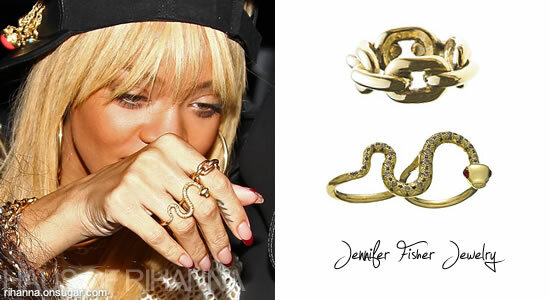 Rihanna is a huge fan of Jennifer Fisher Jewelry. So much so that she wears some piece of jewelry from their collection almost everyday. She is most often seen in the XL Chainlink Ring (rose gold) and the Double Finger Snake Ring. She likes to stack her Mini Disk Rings with pave white diamonds and another favourite is the Stud Ring with pave white diamonds. To find out more about Jennifer Fisher Jewelry please visit the official website.